KISSIMMEE, FLA. – July 11, 2017 – East Coast Defender’s recent “Project Blackout” showcases the balanced power of the LC9 small-block engine wrapped inside a beautifully handcrafted, black-on-black Defender 90. Known for its excellent handling and acceleration, the 5.3L engine is a smart option for drivers who want the convenience of owning a daily driver, as well as a weekend warrior at the beach. “Project Blackout” started out as a 1987 Defender 90, which was located by ECD co-founder Elliot Humble near Norfolk County in England. Project Blackout’s build began in June 2016 and rolled out of The Rover Dome on June 29, 2017. The black exterior with black interior is why this custom Defender was dubbed “Project Blackout”. It is finished in a classic black paint with black checkerplate accents and 18-inch black Sawtooth wheels. Inside the cabin are heated black leather Land Rover seats with black instrument panel and Momo leather wrapped steering wheel. 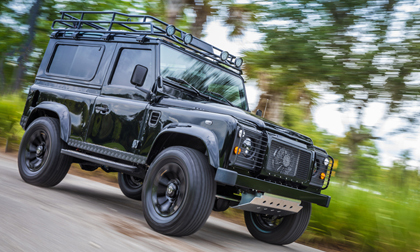 Located in Kissimmee,Florida, East Coast Defender is an award-winning builder of premium Land Rover Defenders. With over 25 years of Land Rover Defender building experience, ECD has earned a reputation for its commitment to perfection, its dedication to build quality and its ability to maintain the heritage of the Defender while modernizing it for clients. East Coast Defender has grown tremendously and has expanded the term “luxury vehicle” to “all-terrain multi-functional luxury vehicle.” East Coast Defender currently has over 30 full-time employees in its 21,000 square-foot facility. For more information, please visit EastCoastDefender.com or call (407) 483-4825.